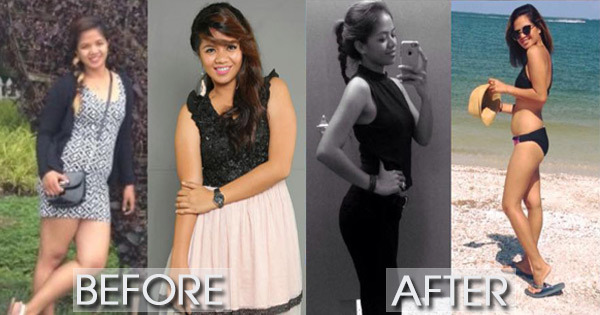 Filipina blogger Mona Solis shared some tips on how to get slim and lose weight easily. She also posted before-and-after photos of herself. 1.) Believe me you can live with no RICE. I repeat, NO RICE! I'm a living proof. 2.) SODA! Ah uh, no good for ya girl. 4.) RUN! SQUAT! BIKE! CURL UPS! PUSH UPS! Repeat! I said Repeat! 5.) RUN again! Dagan gane si Anne Curtis ikaw pa kaya? [If Anne Curtis runs, why can't you?] Haha. 6.) Ayaw mog tuo anang Slimming coffee, slimming pills, Herbalife, ug many more ke More calories ra gyud na labaw na nang mga concentrated juice. 7.) Drink 8 glass of water everyday! Drink Water detox (fruit water) Before going to bed and after. 8.) Avoid fried foods!! Gosh! No more prito, no more street foods specially fast food. 9.) Cut your Carbs, means imung [your] Rice 3 x a day plus your pasta plus your soda plus merienda plus pandesal plus pritong saging.. Huhu undangi nalang nig basa maghilak raka [Stop reading this, you will just cry]. 11.) i-pm nalang ko ke kabalo ko dria palang hilak naka [Just pm me because I know you already cried reading this.] hahahaha. But the result? HITA/BUKTON/BILBIL [fat legs/big arms/potbelly] NO MORE! Just do it. Do it now. I did it. Be the change you want to see the world. Do you find the tips helpful? Share this post!